Welcome to the Dingoonity Wiki. This is a static backup of the old MediaWiki. Want to change something? You can now do so through a Github Pull Request. Check out the repository on Github. If you're interesting in editing, check out the Most Wanted edits. Before editing pages, please review these Guidelines. GMenu2X is a frontend application targeted at embedded devices, originally developed for the GP2X and successively ported to other devices. GMenu2X provides an easy to use interface with quick access to the games and applications of the device trough links similar to those found on PC's desktops. Its interface is fully customizable with skins. 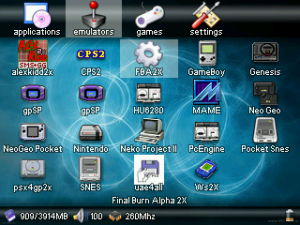 Other features include: built-in selector for emulators, manuals and readmes integration, built-in overclocker, gamma and volume configuration, ram timings tweaker.